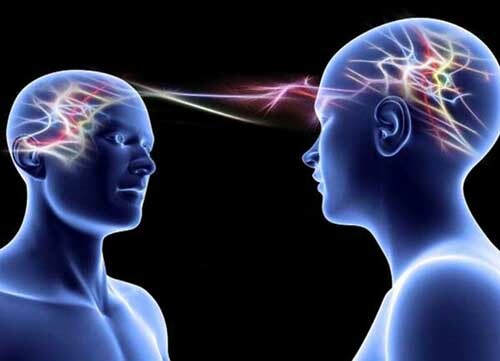 Some researchers say the results constitute compelling evidence that telepathy is genuine. Other parapsychologists believe the field is on the brink of collapse, having tried to produce definitive scientific proof and failed. Sceptics and advocates alike do concur on one issue, however: that the most impressive evidence so far has come from the so-called 'ganzfeld' experiments, a German term that means 'whole field'. Reports of telepathic experiences had by people during meditation led parapsychologists to suspect that telepathy might involve 'signals' passing between people that were so faint that they were usually swamped by normal brain activity. In this case, such signals might be more easily detected by those experiencing meditation-like tranquillity in a relaxing 'whole field' of light, sound and warmth. The ganzfeld experiment tries to recreate these conditions with participants sitting in soft reclining chairs in a sealed room, listening to relaxing sounds while their eyes are covered with special filters letting in only soft pink light. In early ganzfeld experiments, the telepathy test involved identification of a picture chosen from a random selection of four taken from a large image bank. The idea was that a person acting as a 'sender' would attempt to beam the image over to the 'receiver' relaxing in the sealed room. Once the session was over, this person was asked to identify which of the four images had been used. Random guessing would give a hit-rate of 25 per cent; if telepathy is real, however, the hit-rate would be higher. In 1982, the results from the first ganzfeld studies were analysed by one of its pioneers, the American parapsychologist Charles Honorton. They pointed to typical hit-rates of better than 30 per cent - a small effect, but one which statistical tests suggested could not be put down to chance. The implication was that the ganzfeld method had revealed real evidence for telepathy. But there was a crucial flaw in this argument - one routinely overlooked in more conventional areas of science. Just because chance had been ruled out as an explanation did not prove telepathy must exist; there were many other ways of getting positive results. These ranged from 'sensory leakage' - where clues about the pictures accidentally reach the receiver - to outright fraud. In response, the researchers issued a review of all the ganzfeld studies done up to 1985 to show that 80 per cent had found statistically significant evidence. However, they also agreed that there were still too many problems in the experiments which could lead to positive results, and they drew up a list demanding new standards for future research. After this, many researchers switched to autoganzfeld tests - an automated variant of the technique which used computers to perform many of the key tasks such as the random selection of images. By minimising human involvement, the idea was to minimise the risk of flawed results. In 1987, results from hundreds of autoganzfeld tests were studied by Honorton in a 'meta-analysis', a statistical technique for finding the overall results from a set of studies. Though less compelling than before, the outcome was still impressive. Write the correct letter, A-G, in boxes 1-4 on your answer sheet. Write your answers in boxes 5-14 on your answer sheet. Involved a person acting as a 5 , who picked out one 6 from a random selection of four, and a 7 , who then tried to identify it. 10 were used for key tasks to limit the amount of 11 in carrying out the tests. The 13 between different test results was put down to the fact that sample groups were not 14 (as with most ganzfeld studies).